Editor's note: Our guest blogger is James Griffiths, General Manager of WaterTrax, a Vancouver-based software provider that helps agencies and utilities companies manage operational data for their water and wastewater systems. View our webinar series to learn more about Google solutions for the utilities industry. To provide clean water to millions of people every day, utilities must analyze petabytes of data to spot and correct potentially dangerous incidents in water treatment and distribution networks. As a provider of operations management software, WaterTrax is always looking for ways to make data monitoring and management easier and more effective for our utility customers. We integrated Google Maps into our platform to allow WaterTrax users to quickly visualize system data on a map. We created a Google Maps-based tool that provides a spatial display of water system structures combined with real-time water quality data. Quite literally, our product allows utility managers to see how water quality is being affected as water flows throughout the entire system. By displaying complex data in a visually appealing way, Google Maps helps our customers spot issues and identify trends instantaneously. 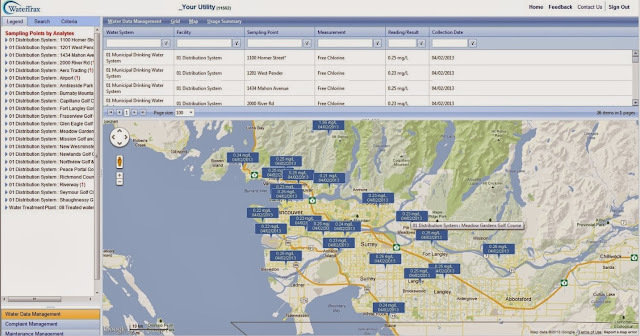 Utility managers get a visual view of recent test results, compliance history, alerts, complaints and sampling schedules — all mapped to specific locations. Instead of poring over spreadsheets and structured tables to spot trends in sampling data, now they see this data right on a map. We’ve observed that customers like plotting sampling locations on maps using street view, satellite view and terrain view. They also appreciate being able to quickly export map data into their Geographic Information System (GIS) databases. Going forward, we’ll continue to add enhancements to our Google Maps offering. Already, we’ve added features based on customer feedback. California-based Golden State Water Company wanted to see a glimpse of their chlorine results to know if sampling was up to date and contaminant levels were within acceptable ranges. So we created a search feature in Google Maps to display only the most recent test results. 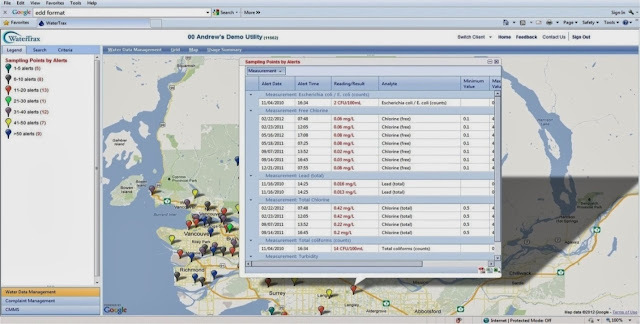 This feature would be most beneficial during an emergency situation such as a high chlorate incident, where Golden State Water would use the WaterTrax mapping interface to track real-time data across their system. The searchable map shows the most recent lab results, so the team can visualize in real-time where chlorate levels increase or decrease to take immediate action. At WaterTrax, our goal is to make real-time data monitoring easier for utilities. Google Maps allow our customers to spot potential problems quickly, so they can ensure public water safety and quality for millions of consumers every day.